A Chinese black tea with dried cranberries and peach flavoring. For those cranberry lovers! This is a different flavor combination – I don’t typically see the flavors of cranberry and peach blended together, but, they work together quite well. The tartness of the cranberry is curbed just enough by the sweet, juicy flavor of the peach to make this a slightly tart, pleasantly sweet taste. 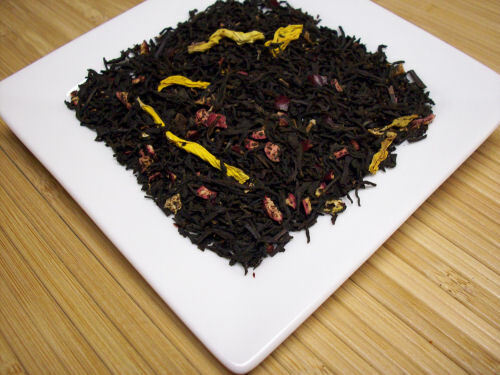 The black tea base is strong and tannic in this blend, and is just a little too astringent in my opinion. Not bitter, but, very dry – almost to the point of being what I would describe as starchy. It is not off-putting, though, and I am still quite enjoying this cup, but, if I were to change anything to make it MORE enjoyable, I would soften the astringency here. The cranberry-peach combination is this tea’s saving grace. The cranberry is bright and bursting with flavor, and offers just a hint of berry tanginess complete with a pleasing berry tingle on the tongue. The peach is smooth and sweet, and hits the palate right up front, and lingers until the finish. This tea is enjoyable served hot or cold – and perhaps it’s just today’s warm weather talking here, but I found it especially refreshing iced. All things considered, this is a very tasty tea.